When I first tasted roasted portobello sandwich, I took all the mushroom slices out and ate just the bread. It was too meaty for my liking and I vowed never to lay my hands on it again. Even though crimini and shitake were regulars in my kitchen, portobello took a long time to be accepted. Until I learnt to tame the beast, that is. I understood that this meaty fungus takes more than a simple salt and pepper seasoning. Taking inspiration from a restaurant meal, I recreated the recipe with few twists of my own. The cavity is filled with spicy tomato-cream sauce(or any tomato sauce you have on hand) and topped with two kinds of cheese, like a pizza. To make it a wholesome meal, I serve it on a bed of salad greens. The tomato-cheese filling is spicy, tangy and creamy; the greens, dressed with a simple lemon vinaigrette, are crisp and fresh. Healthy, filling and best of all, tasty. Now there is no reason not to welcome this mighty but, tamed beast, into my kitchen. This entrée salad goes to No Croutons Required - Mushrooms, a monthly soup and salad challenge hosted by Lisa and Holler. Preheat oven to 400F. Clean mushroom caps with a damp towel. With a small spoon, gently remove the gills and tough stems. Season the cavity with salt and pepper and spoon marinara sauce into it. Top with mozzarella cheese followed by grated parmesan. Bake for 15-18 minutes, until the cheese is brown and bubbly. Let the mushrooms rest for 2 minutes. Meanwhile, dress salad greens with lemon juice, olive oil, salt and pepper. 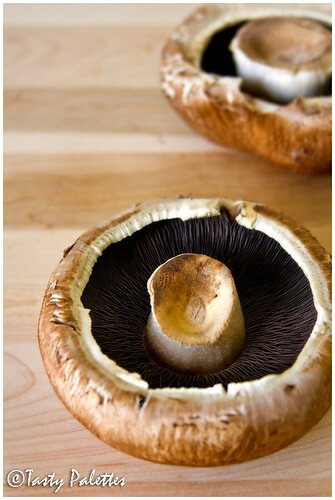 Serve warm portobello over the greens. DELICIOUS. I have bookmarked them for making. I don't think it is the season of these wonderfull mushrooms here. what a spectacular dish!!! i've eaten the stuffed version topped with crisp breadcrumbs. love that as well. Interesting recipe! The taste for portobello shrooms is an acquired taste and am no where near enjoying it. Lovely presentation and neat pic. This looks divine!! Thanks so much for your entry. spectacular shot sug. i love the idea. my friend had made similar one with little bit of bread crumbs. I came across your blog during a search for recipes that incorporate collard greens/kale in Indian dishes, and your Dal w/ Collard Greens has been a staple in my kitchen ever since! You've got very creative takes on some of the most nondescript ingredients out there, if I may say so! you show that beast sug! I love it with gorgonzola cheese. glad you found a liking for the portobello because i think it is ofen under-rated. it is so versatile and a regular at our place during summer BBQ season! Oy delish!! Btw - square glass plates are all the rage these days no? I ate in two different uppity restaurants recently and was quite struck by the similarity! I know what you mean about "taming" it... I love raw mushrooms, but I still have trouble eating them cooked in almost any form because of the texture. I guess I still need to work on that. That stuffed mushroom looks good. Great photo! Nandita, I am flattered. You can try the same with any decent sized mushrooms. Just vary the baking temp. HC, Try this and do let me know. Bee, I love breadcrumbs version too. They are great for smaller ones. Rachel, Mushrooms' taste and texture takes time to get acquainted with. But most of the restaurants here serve only mushrooms as vegetarian options. I have also posted the breadcrumbs version, Sia. The sandy texture of breadcrumbs goes great with mushrooms. Anu, I am thankful for such nice words. I am glad you dropped by. Hoping to see more of you. Smita, you noticed ;). Aren't they such an eye-candy. Even if its so-so khichdi, it gets hypes in this glass square plate. Its available at Crate and Barrel. Its ok, Kalai :). Come back to your senses and try this. Hope you like it. So true, Hannah. I don't have problem eating raw white mushrooms. This guy here is quite tricky. May be a drizzle with 'cream' sauce with tahini oughta do it. Kevin, Thanks for your compliments. Much appreciated. Lovely! And whats even better: the fact that i bought some portobellos y'day :). You made that mushroom look sooooooooooo good! Oh wow....the baked mushroom looks so good!!! Totally droolworthy. My mom makes stuffed portabellos for my dad all the time, and he would adore your recipe. I'll be sharing it with them for sure. Suganya,I looooove portobello's. Big ones, baby ones, I can eat them forever! I just wish my pocket book can afford to eat them everyday, they can get a little pricey. Stuffing them with the tomato cheese filling is mouthwatering! Suganya, I love portobellos, and agree they need more than just simple seasoning. Your dish looks gorgeous and the pictures are, as usual, lovely. 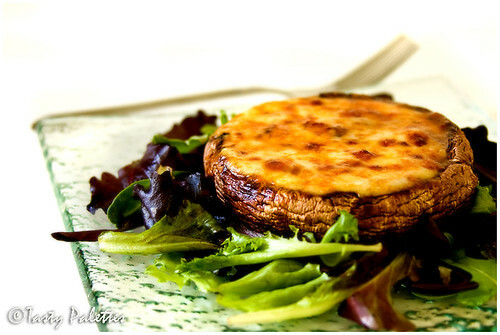 This looks mouth-watering, give me cheese with mushrooms any day of the week. Yum. Suganya, this dish looks completely amazing - you've really outdone yourself this time. You may have been slow to come to Portobellos, but you're definitely roaring down the home stretch with this one. Great job! I love portobello mushrooms! The variations in recipes are many and the mushroom is a welcome ingredient more so than any meat. This is a truly complimentary mushroom. Congratulations on winning the No Croutons Reqd!!! Thats great going! It is a fabulous recipe! I think I need to make this for supper. Right now. That's an awesome looking mushroom dish! 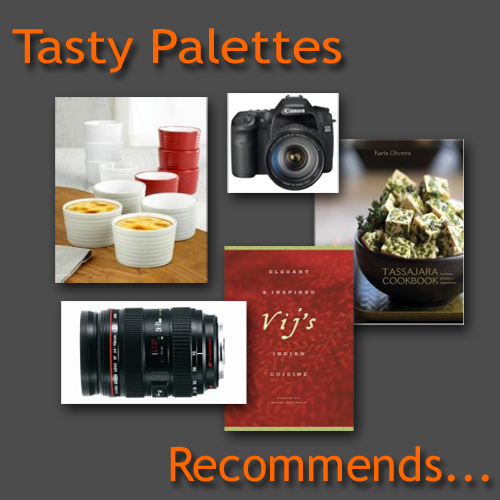 Fabulous pictures and a great recipe!! Congrats!